Disclosure: An electronic copy of this book was provided to me by the author for my review. All ratings, comments, thoughts, and opinions are my own. A caution for Kindle readers: there are several sections of the book that have formatting issues and a typo or two can be found as you read along. Nothing so egregious that it pulled me out of the story, as it was mostly issues with random paragraph indentations, but that may bother some readers more than it did me. For the seditiously unpopular (among the living, anyway...the dead actually think quite highly of him) Milrose Munce, life couldn't be better. After triumph against an evil guidance counselor (and all around bad chap), he and his girlfriend Arabella are basking in the golden era of goodliness at school, firmly ensconced in their own superiority of all things wickedly weird. But life being what it is, something new and grotesquely horrific is quite literally growing in those not-so-hallowed halls...and in the vents, and across desks and blackboards and even...if they sit still long enough...the students. This verdant oddity definitely attracts Milrose's attention; he even musters up some mild concern, but his darling Arabella seems peculiarly (which for the girl should make her almost normal in comparison, yet truly doesn't) unfazed by the creeping cornucopia. Then two of the people most dear to Milrose disappear, and more than his concern is mustered. First, the new and beautiful principal, Caroline Corduroy is suddenly gone from her office, an office that is now completely overrun with flagrant flora, then his soul mate, the reason for every ounce of the happiness in his heart, his Arabella, disappears without a trace...or topiary. Disturbingly heartbreaking, her loss truly incites Milrose's panic and occasional despair, but also births his determination to deflower this current pernicious threat as it spreads through the school. 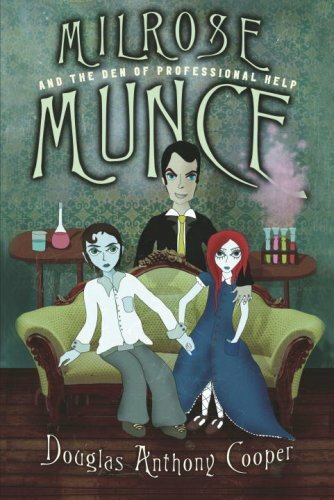 Milrose, along with his creepy coterie of grotesquely gruesome ghosts (great guys and girls, all...well...except maybe for Percival), must discover the cause of the spreading fungal malignancy and alter its aliveness before Arabella and the almost as wonderful Principal Corduroy are lost forever. Oh, yeah, and saving the school...again...would be nice, too. But mostly Arabella. Welcome (or welcome back) to the world of Milrose Munce, my favorite overachieving underachiever, and the brilliant - if twisted - mind of author Douglas Anthony Cooper. I love this world. I wouldn't want to live in this world, but I do so enjoy visiting. Cooper has created a masterpiece of the hilariously macabre (again), and once again wowed me with his deliciously sarcastic and frighteningly lovable characters doing significantly sardonic and slightly terrifying things. As far as heroes go, you can't get much better than the reluctant Milrose, who would much prefer being not at all heroic, but can't seem to help himself. Academically brilliant, he's less than the most intellectually superior in greenery hostage situations, and while I'm sure that says something horrific about the quality of education in public schools in a socially conscious way, I doubt social consciousness has ever been considered as rip-roaring a good time as Milrose's passionate pursuits. I love this book. I've loved both of them, actually, but this one offered up a more layered and cohesive plot than its predecessor (not that Milrose Munce and the Den of Professional Help wasn't layered or sticky or anything, this one was just more so), and Milrose got a chance to sneak beyond the halls of matriculation in several scenes I thoroughly enjoyed. Arabella's disappearance obviously lessened her appearance in this one, but I loved what Cooper did with some of the ghosts, making their roles more visible in the arc of the conflict than in the previous book. Frankly, though, I've got to stop reading about Milrose when I'm in public, because the sound effects draw the most peculiar stares. Gaggled giggles, snickering snorts, chuckled chortles and the like come so fast and often that anyone within hearing range thinks I forgot to take my medication this morning. This is a funny, funny book. Galactically funny; universally funny. Not to mention sharply, intelligently funny (which is my favorite kind). It's that humor, along with the unique and original characters and story, which has turned me into such a rabid fan of these books (ignore the slavering, please...it's impolite to stare). Douglas Anthony Cooper has, in the Milrose Munce exploits, created a reading experience that is simply but sublimely satisfying for me. It happens sometimes (if you're...you know...lottery-lucky). 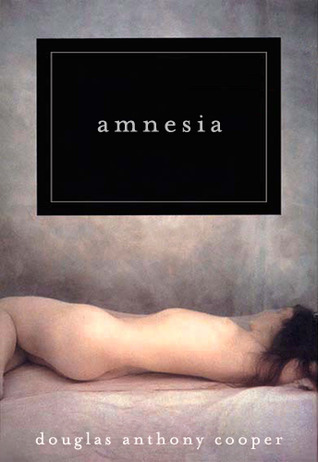 Sometimes you stumble across a book that hits on so many of your happy spots, or appeals on so many levels, or is so stylistically in sync with your reading preferences, that the book resonates with a bizarre sense of intrinsic rightness in your pleasure centers, whistling a jaunty tune as it makes you feel good. For me, that's Milrose Munce (or possibly gastric distress...but my money's on Milrose). Yes, it's a book that points in the YA direction - though I'm not convinced that's the right market. It's perfectly fine for them to read, as far as the material goes, but I actually think I appreciate this more as an adult than I would have when I was young (those many, many, many years ago). Hey, I would have loved it back then, don't get me wrong...I just don't know that I would have appreciated it (or...ahem... possibly understood it) as much as I do now. Not to be repetitive or anything, but I repeat, I loved this book. Milrose Munce is like...the legitimate but disturbed love child of Encyclopedia Brown and Nancy Drew...if those mystery-solving kids married, got rich on a pyramid scheme, relocated to the Twilight Zone, bought the House on Haunted Hill, munched down on a few of those funny-type mushrooms, and birthed progeny. Then named said progeny Milrose. 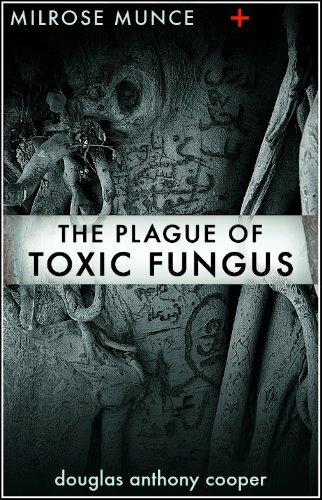 Milrose Munce and the Plague of Toxic Fungus is a funny, fast read with characters that are as entertaining as they are gruesome, has a plot that works a little better than it's predecessor but is still weird and occasionally incomprehensible (in the best ways), and is set in a world that's highly unusual. I highly recommend it to anyone who loves their inner sarcastic and wisecracking social outcast (who would probably be beloved by gruesome ghosts). "Unhand me, you piteous filth-bedecked excuse for a mild infestation..."
"Sure buddy. Start with gravity. Let's see you ignore the law of gravity.